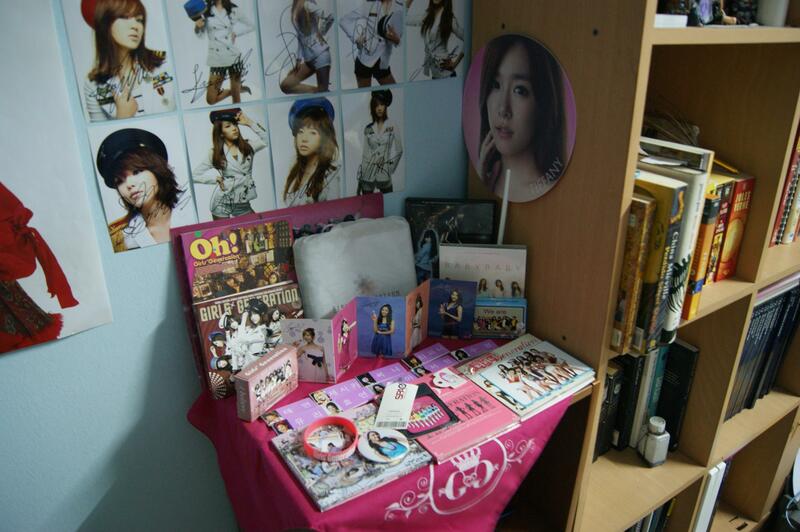 So, this here is my shrine to SNSD. I am sure you guys can identify the easily recognisable official stuff here, so I won’t bother with them. So, of course I got the Fany SM Town fan. The two packs of playing cards I will show later. The 9 name tags are for each of the girls. I found Soo Young’s recently, who was missing from the old pic. 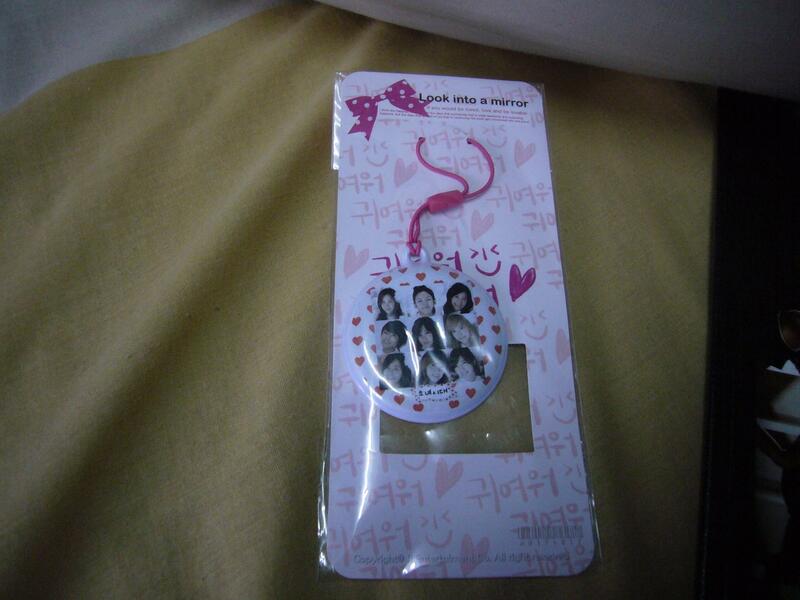 There’s a pink rubber bracelet next to the Yoona button badge, but more on these later. The pink cloth you see is actually an SNSD bandana or scarf that I managed to get off Mystar in a fit of consumerism. 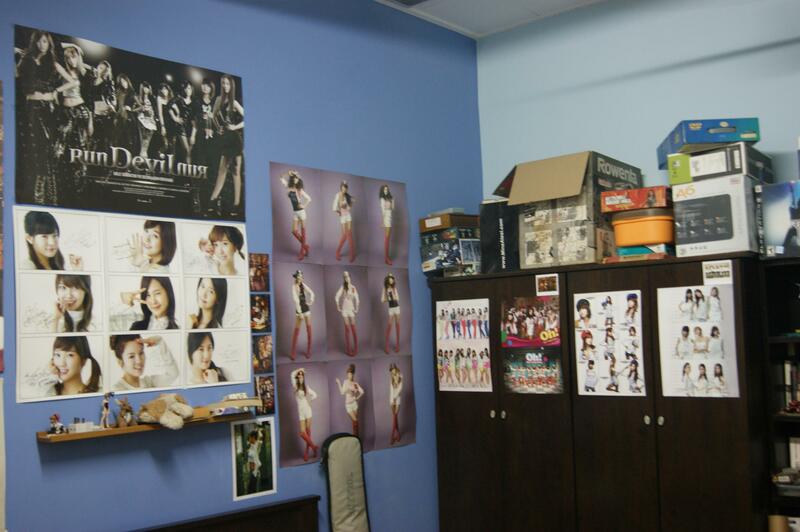 The photos you see on the wall were purportedly signed by SNSD themselves. I dunno, but if they were fake, whoever faked them is good. 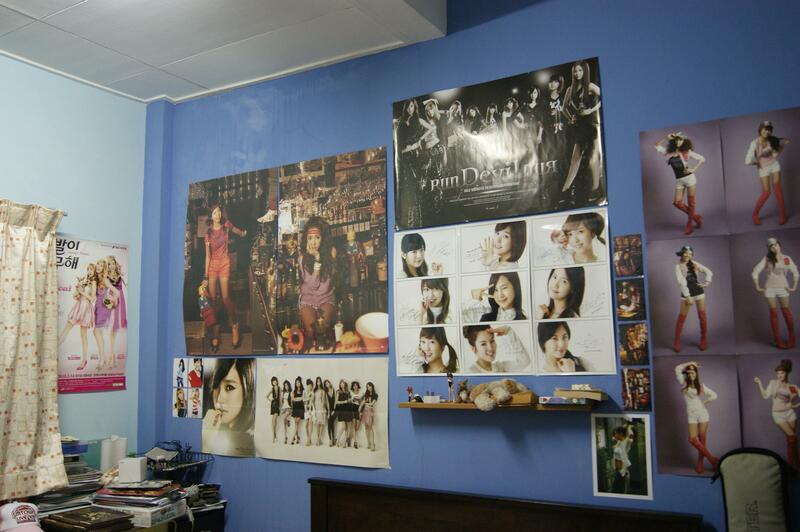 A view of the corner of my room with the Gee, Genie, and Oh! album posters. That is a photoprint of Tiffany in a red piratey dress next to the signed photos. [UPDATE] So, I went a little crazy with the blu-tack. I pasted all my V06 series photos on the little bump in the wall and the SM Town postcards on the cupboard doors. And yes, that’s the SM Town poster up there above the cupboard. And yes, that’s Cabi Yoona next to red dress Fany. The SPAOh! poster, next to my autographed Baby Baby poster (Once again, I can’t begin to speculate on the real-ness of the sigs) and on the other wall, the first Maple Story poster. On the dresser is my Goobnae 2010 calendar. 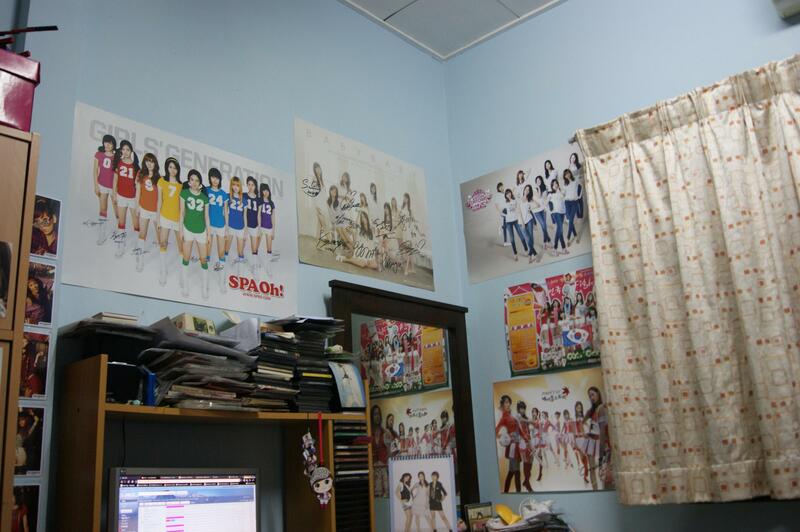 [UPDATE] Added the Star Collection Cards S2 promo poster and the SM Town SNSD Poster above the Maple Story poster. Ah, the Legally Blonde poster. I hear it’s hot stuff. =P But mine’s a little creased down the middle. =( Then the 2-ny posters from the 1st Asia Tour set. And below the RDR poster is a set of 3 glossy posters with printed signatures. That set started my collection. 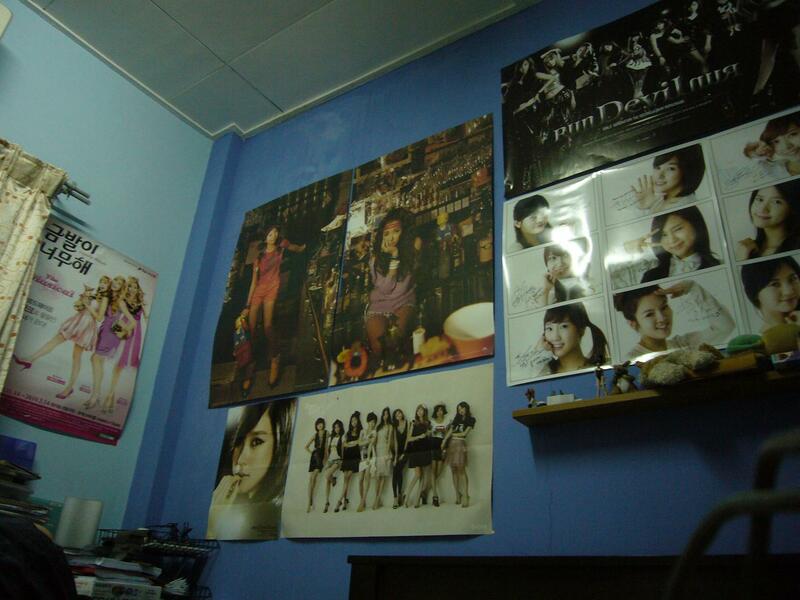 Below the 2-ny posters are the RDR Tiffany poster and the Goobnae leaflet that came with my 2010 Calendar. Neat eh? 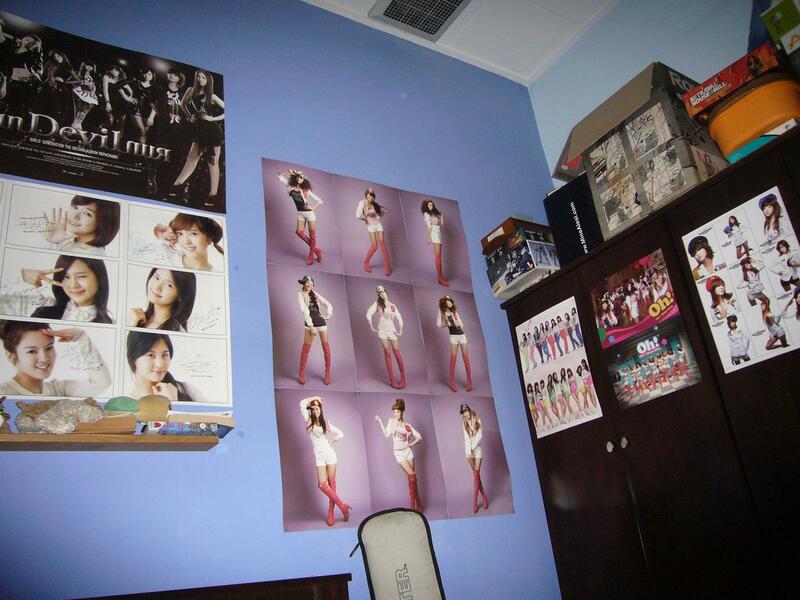 [UPDATE] I added the Set A Postcards next to the Fany RDR poster. And in the gap are photos of Fany, Sica, Yoona, and Seohyun that carry their signatures. And under that is the picture of Yuri tying her hair up in the Cabi advertisement that I got a print shop to print for me. I figured that if I can’t have posters regularly, I might as well print them myself. Then, I ran into the 300 dpi problem, which is why that picture of Yuri is only A4 sized. The 9 1st Asia Tour Bromides stuck side by side. And a little bit of my closet with some rather good quality 3rd party printed posters. [UPDATE] The only thing different with my closet is that I have added two small postcards printed by a third party printer. Yeah, they weren’t there before, as you can compare with the photo below. 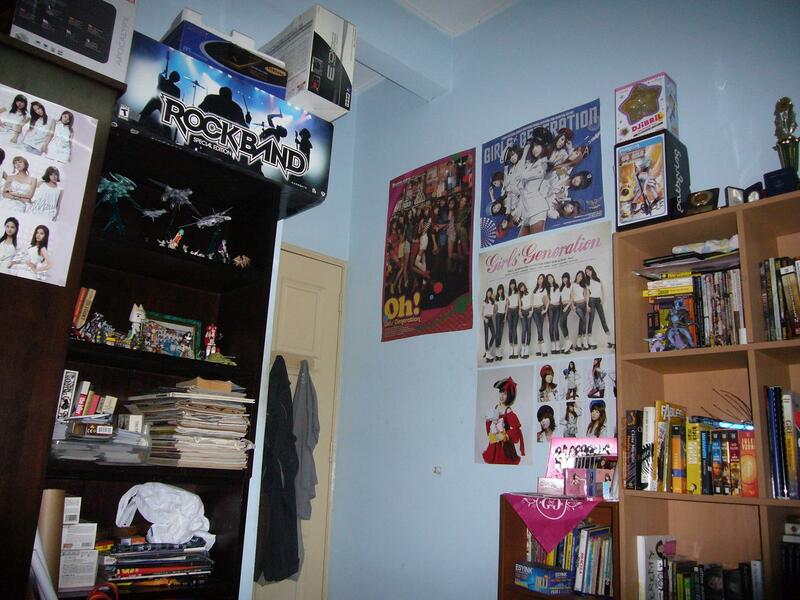 And there you have it, an overview of what’s in my bedroom. 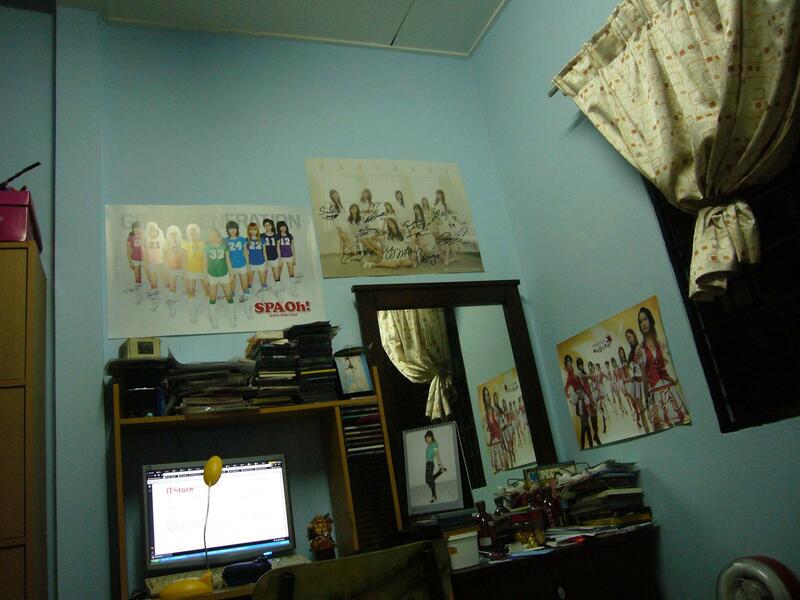 I aim to cover every single cm of space on the wall with a poster with SNSD on it. Then, when the walls are done, the ceiling. Next update: close up photos of the interesting stuff (or not) in my collection. 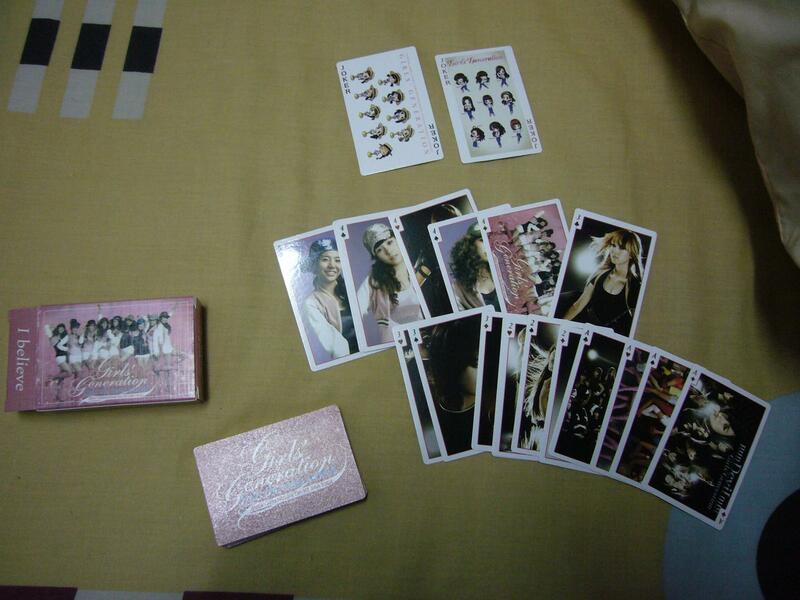 This is a pack of SNSD faced cards. 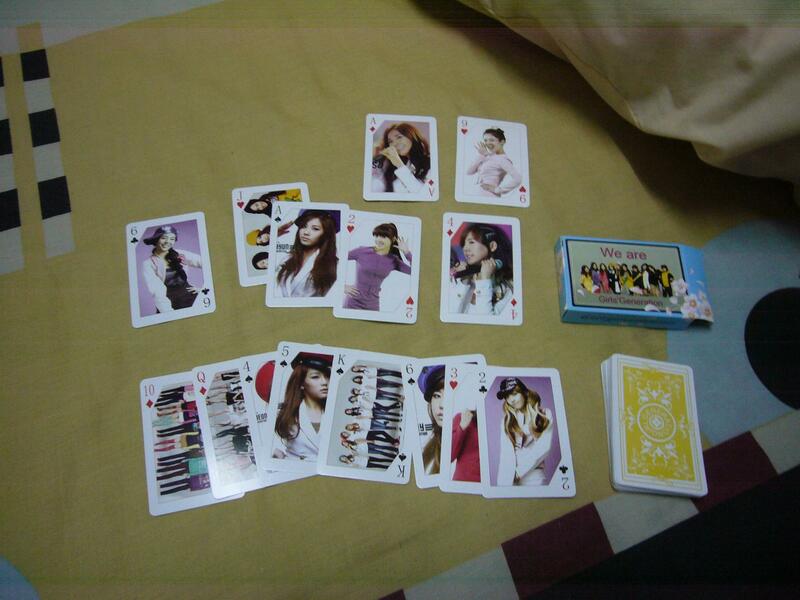 As you can see, unlike the other ones on ebay, this one does not have a single SNSD picture as the back, instead each and every card face is a photo from the vast collection of SNSD photos. Neat eh? It’s even printed in China, but this set’s print quality is better than normal. This pack is similar, but it is printed in Korea. You can probably tell that the card backs are a lot nicer (It’s even textured!) and this pack cost me double that of the China made one. Although, TBH, I like the China pictures better. This one’s pictures are a little too common. And this. This is the phone charm to end all phone charms. Well, to be honest, it is a little too cumbersome to be a good phone charm. What I did was I hung one under my car’s rear view mirror. That was some months back. Even under the hot equatorial sun, the colour never faded. If that doesn’t impress you about the quality of the panels, I don’t know what will. The best part: The price tag. These little babies go for RM8.90, or if you are thinking in USD, USD2.80. Not bad eh? For you newbies, the name on the phone charm is Tiffany. That should clue you on my favourite if the earlier posters didn’t. Simple , functional and you can use it as a conversation point: “Oooh! What does the Korean on your phone thingy say?”. That’s when you educate them in a little bit of Hangul. Ahha. 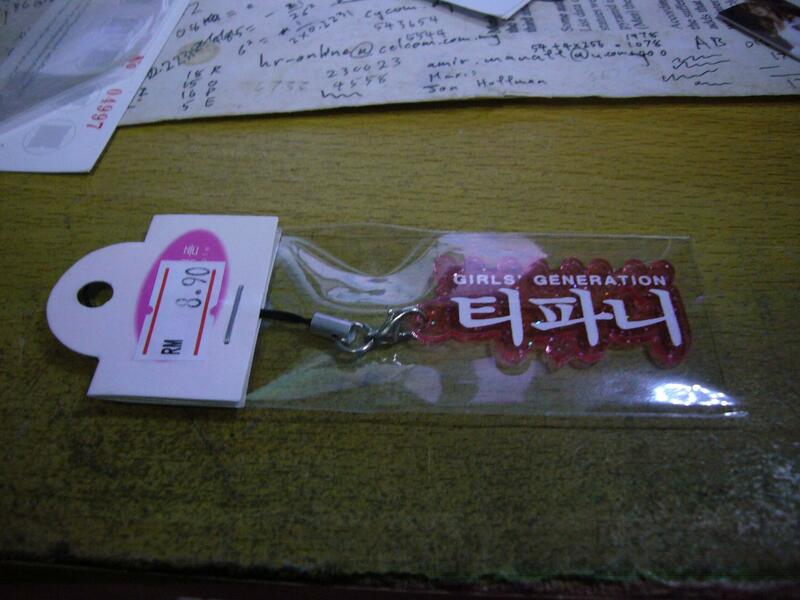 A rubber phone charm with the SNSD logo. I suspect this piece has some ties to the official fanclub and all that. But then again, I got it for like RM20. Official Fanclub stuff can’t be that cheap right? It’s currently attached to my erstwhile Nokia E63. A button badge. With Yoong on it. Well, I would have gotten a Fany one, but there weren’t many left at Mystar when I went on the shopping spree for cheap stuff and this one happens to be one of the nicer ones. I am sure you guys are bored with my non-official stuff right? 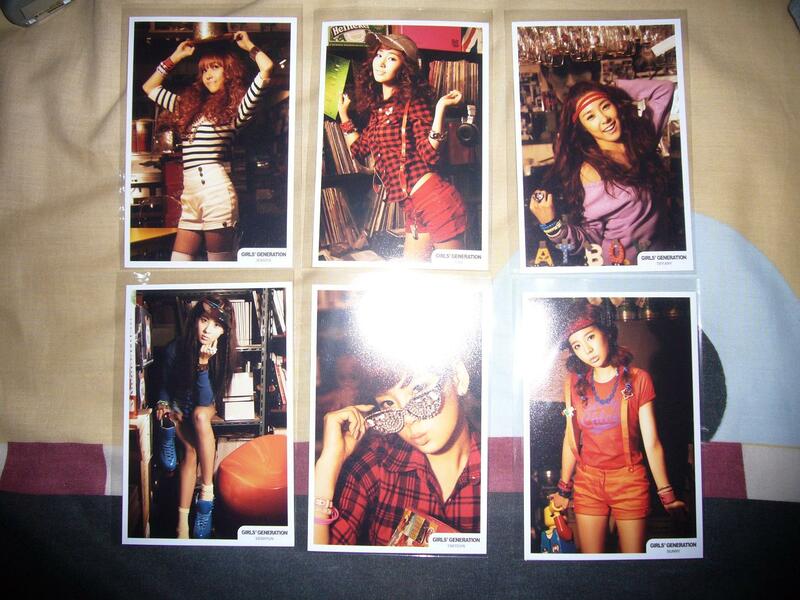 So here are some photoprints made by SME. 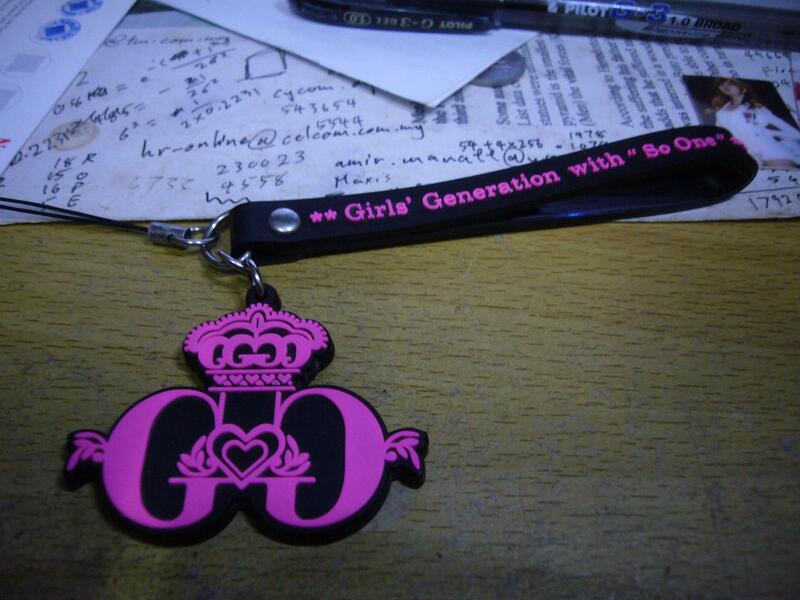 They are on Soshigoods for about USD3 apiece. I got them for RM7 each. The downside? There were only six different ones available at the shop at the time, so these are all I could get my hands on. And now, for the serious business. The first of my signed ITNW posters: Tiffany’s. I left the set in the cardboard tube most of the time and I only take them out for photo ops like this. Nothing much to say here, except that Fany’s signature sure is huge on this one. btw may I know where did you get all your stuff in malaysia?? 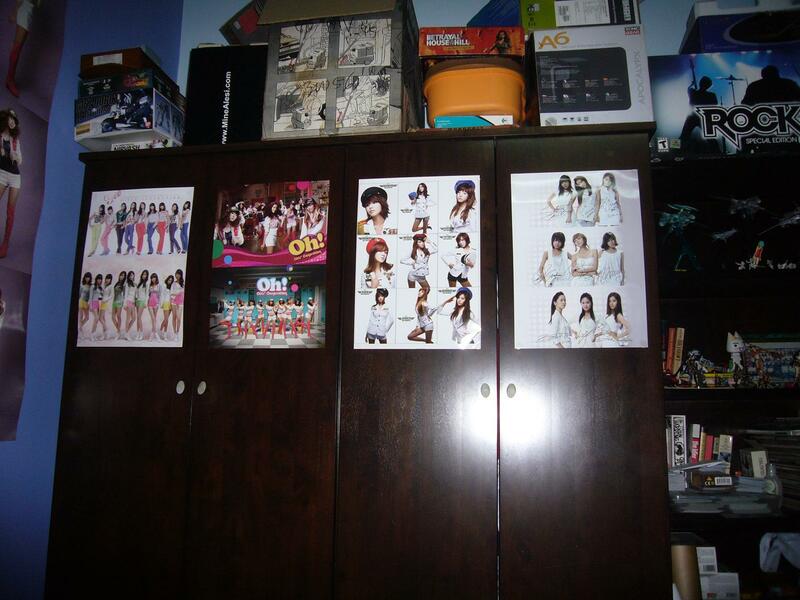 can you help me buy the snsd’s smtown 2010 poster?? I want to buy it from yesasia but the shipping price is bugging me and I thought I want to grab it later when I have some extra money but now it has already out of stock..
looking forward fot your replies.. thanx!! I think they are also out of stock of the poster now.. =( SONE’s have been kinda nutty with the buying. owh that’s too bad.. I really want the poster..
btw wanna confirm since I’m not really familiar with KL..
Berjaya Times Square is near KL Sentral right..
Well, if you can get to KL Sentral, all you need to do is take the Monorail to the IMBI station. Berjaya Times Square is the big orange building next to the station. 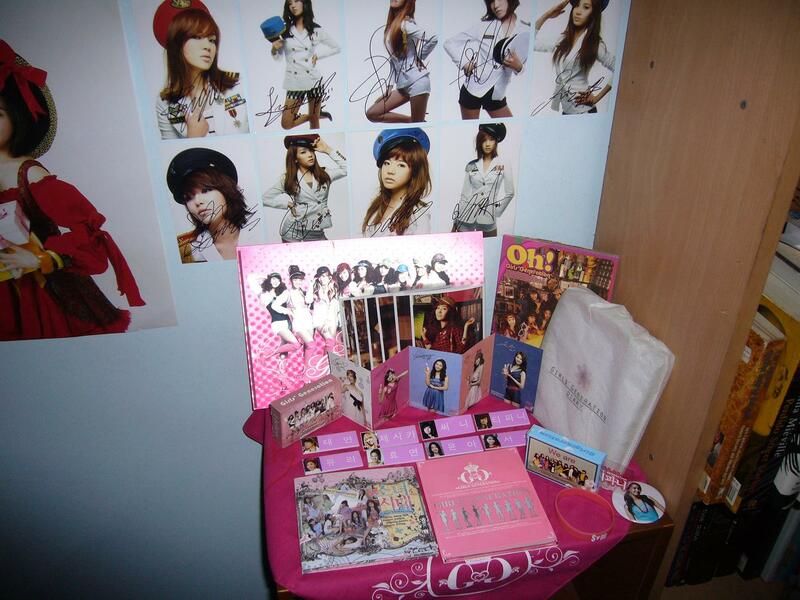 How much is the tiffany signed poster? Is that original signature? Actually, I have the entire set autographed. It cost me RM 250 as opposed to RM 120. Glad you liked my room. ^^ There are more stuff now, of course. 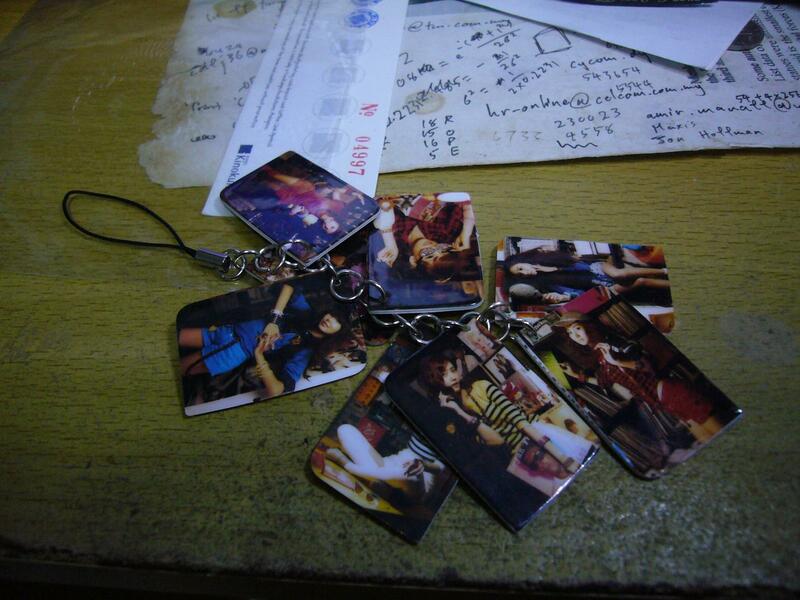 Just that I am a little lazy to photograph them lol. 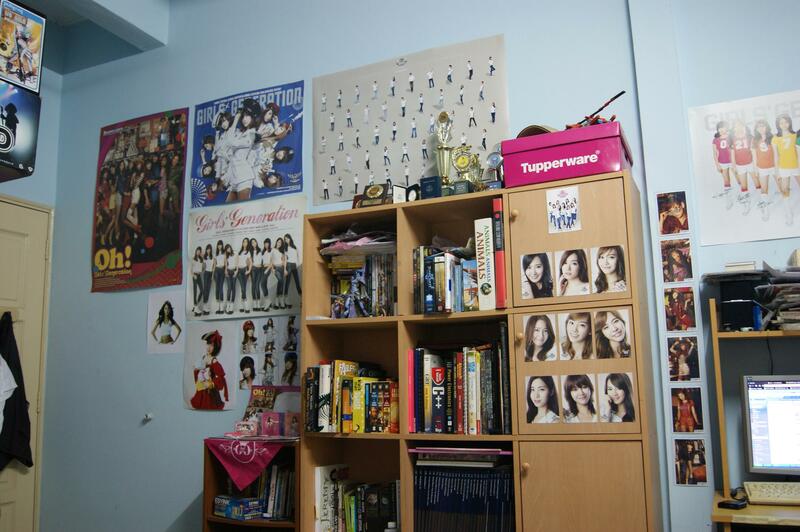 your room is so full of soshi! hahah love it! huh..too bad i don’t live in KL(i live in alor star)..i want to to go to mystar so BADLY!! !